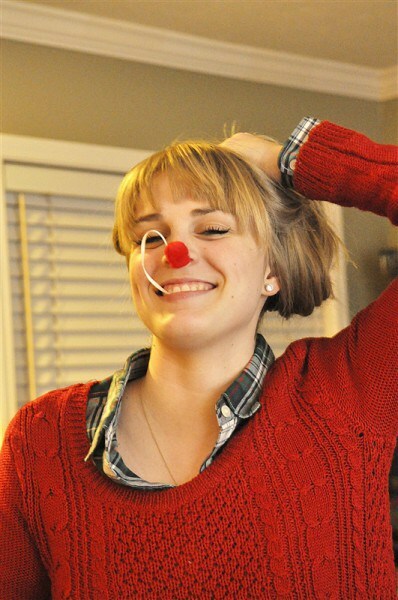 Shake things up this year and play some hilarious Christmas Games. Most of them don’t require any preparation and you probably have all the supplies ready in your house. All you need some good mood and some fun wanting players. 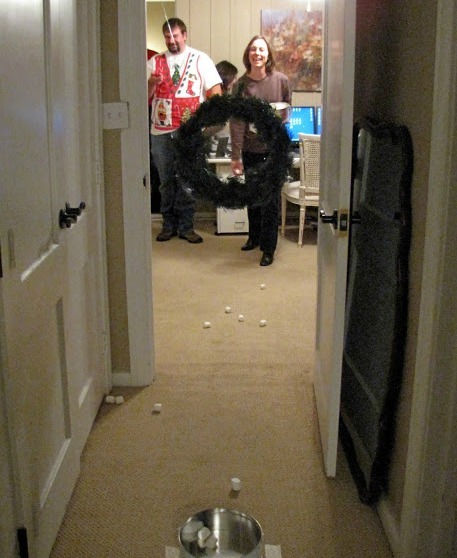 To start, here is a short video of our family playing Christmas Games. By now, you have probably seen those viral videos on the internet of people wearing a mouth re-tractor and trying to say words so others can try to guess what they are saying. It’s like having a lot of marbles in your mouth and trying to talk at the same time. Get the printable cards with 100 phrases here. 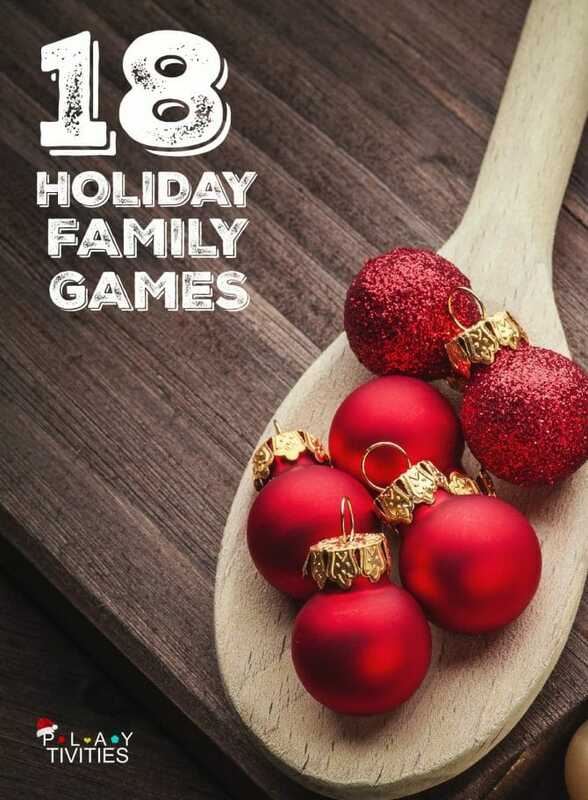 This year we’ve collected all of our favourite games into one bundle of 51 Christmas Family Games Ebook. 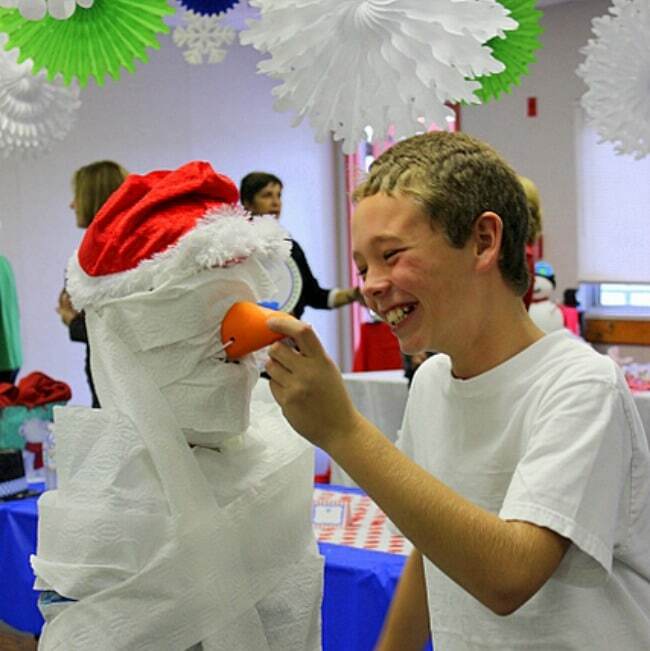 Fun games, activities, silly game and team building tasks – anything you want for you family night! Each game is perfect for all family members. So grab your copy and start creating your Christmas Memories Today! THIS IS IT! 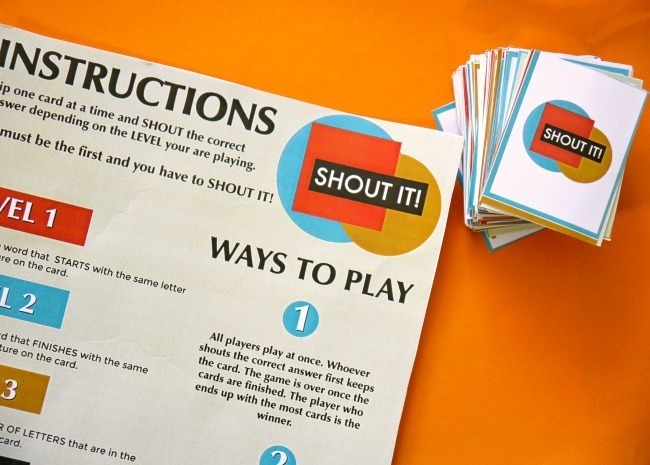 A perfect family game that will have everybody play all night long. It’s Fast, Fun, Easy to Play and even educational. SHOUT IT! has 4 levels and 2 ways to play so everybody can have fun. Perfect for kids and grownups, 2-10+ players. Super simple, yet pretty genius game where not so perfect drawing comes in handy. It’s like a broken telephone game, only this time is in drawing. 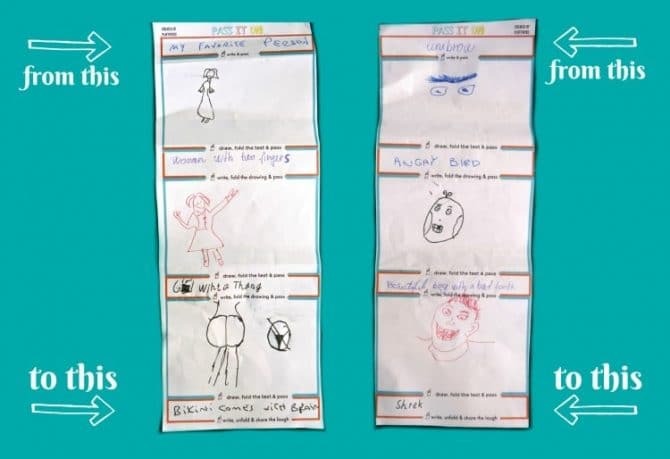 Draw what you see then guess what you saw for hilarious and unpredictable outcomes. It’s miscommunication at its best! Perfect for terrible artists! It’s our go-to game when we have 6 players. Get the printable files and instructions here. Let all the players sit in the circle. One player has the candy in his hands and goes to each person and pretends to give them a candy, while only one person secretly gets the candy. The rest of the players have to try to guess who really got the candy. Find a pair of big size pants (red ones if you can find it). Form teams of two and tell them to wear the pants: one player puts his right leg in the left side of pants and the other puts his left leg in the right side of pants. Now tell the teams to race across the room. It’s fast, it’s fun and it’s hilarious! Find the instructions here. 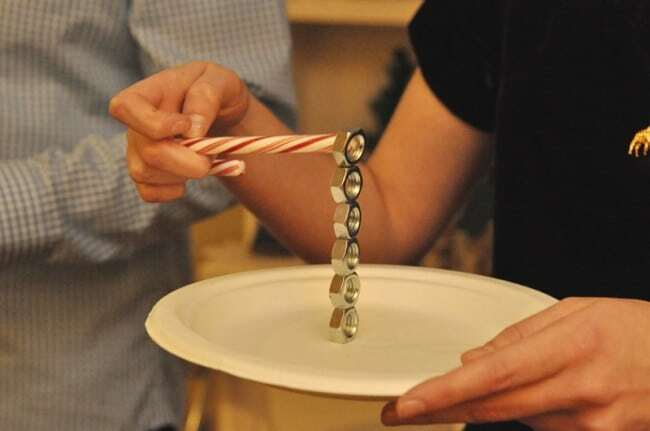 This is a hilarious Christmas Holiday Game for families and for larger groups such as schools. Find the details of the game at Party Wishes. Cut the bottle in half, attach the rope and tie it to the player’s waist. Fill the cup (or the box) with ping pong balls. Turn some fun music on and let the contestants dance, shake, jump the ornaments (or balls) out of the container. First one to have the container empty – wins the game. Cut the ends of pantyhose and then cut the hole on the ‘belly’. Put in on the player’s head and try to stuff it with the balloons until it’s full and standing up. Whichever team does this first – wins the game! Draw 3 elves standing around the Tree. After everyone finishes drawing, have them take the plates off their head and look at their masterpiece. The laughs you will have! Pick the drawing that is closest to the instructions were given. 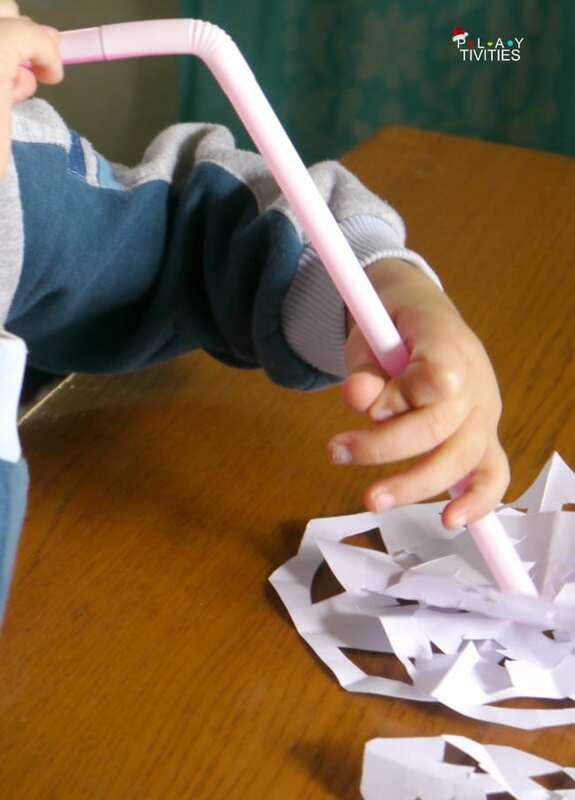 Straws and some paper snowflakes. Tie a pillow to the player’s belly with the ribbon and play traditional Limbo game, only this time it’s little more fun to juggle underneath the rope with the pillow/santa belly. For the people that made it through, slightly lower the rope and have everyone go through again. Continually lower the stick until one winner remains! Divide into teams, then setup a relay course. You’ll then have the first person put an ornament on their spoon, go around the course, then come back to the next person. However, you CANNOT use your hands when passing off the ornament, as it must be passed from one spoon to the next. If you drop the ornament in the process, that person needs to go around the course again. Once the ornament is successfully passed off, it’s the next person’s turn. Separate your group into teams of four (you can have an unlimited amount of teams). For each team, you’ll then set up cones 15 to 25 feet apart. The first player starts off putting a balloon between their knees and waddling down to the cone, just like a penguin, and back. When the team member returns, the person must pass the balloon to the next team member before they can go. The first team to have all four members complete the relay wins. But if any team member drops the balloon, they have to restart back at the beginning! Find the rules for this game here. Play Holiday music and tell everybody to dance. After the music is randomly stopped the players need to ‘freeze’. Walk around the players and try to make them laugh so they would move. Whoever moves – looses the game. 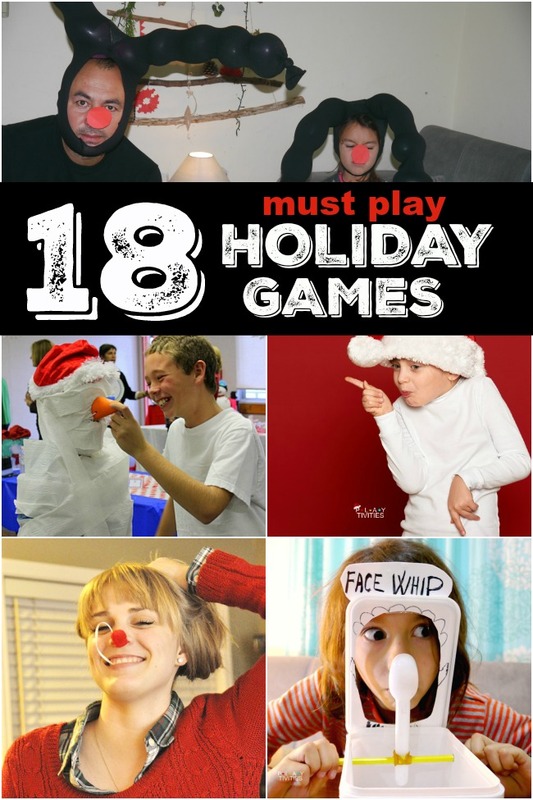 It’s super fun and hilarious holiday game for the entire family. Get this game here. Tie the carrots to the ribbon and then tie them to the player’s waist (on the back). 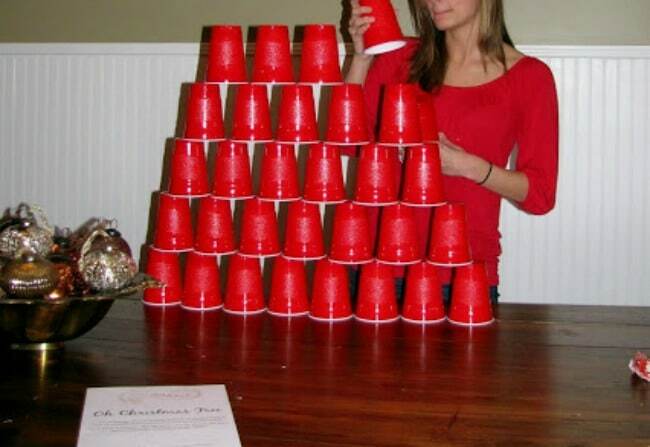 Place the cups on the floor and tell each player to put the carrot in the cup without using hands. Find how to play this game here. Find how to play this fun game here. What is your favorite Christmas Game? Share yours in the comments below.